Baglietto and CCN shipyards have appointed Grant Colin Henderson to head the office in Fort Lauderdale, Florida in the position of Sales Manager for the Americas. Henderson will report to Alessandro Diomedi, Baglietto’s Sales Director, and will have the main goal to expand the presence and visibility for Baglietto and CCN in the Americas markets. After graduating in 2002, Henderson held several high-responsibility positions in the yachting sector in the US. He was formerly Sales Executive for Sanlorenzo of the Americas and through YachtBlue, represented Marquis Yachts for the east coast of Florida for 6 years. “I am very enthusiastic with this challenging opportunity –says Mr Henderson- I love the product. Baglietto is an iconic brand with an amazing heritage but they have also great plans for the future. The company is growing and expanding in the Americas and I am willing to give my contribution.” “Grant Henderson is the right person for our brand – says Alessandro Diomedi, Baglietto Sales’ Director- He is enthusiastic about the product and has great expertise in the yachting business. I am sure with his contribution we will reach great results in the nearest future”. The 1414 Demon created by the long-established Austrian company Frauscher Shipyard, is a true masterpiece. After winning the Best of Boats Award 2016 the largest motor yacht currently offered by Frauscher was also distinguished with the German Design Award 2018. The top-flight jury in the nominating procedure for the German Design Award has very high expectations of the contestants. Only pioneering products from the international design landscape with design features that stand out from the crowd are considered for the award, which is given once every year. The winner in the category Excellent Product Design 2018: the Frauscher 1414 Demon. 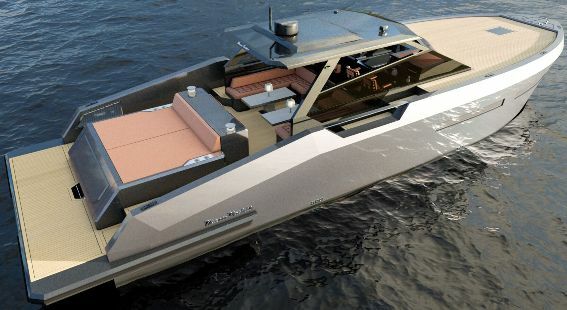 Designed in partnership with design studio KISKA, experts are impressed with the “unconventional automobile aesthetics that stand out from the usual yacht design standards” as well as a “unique interior with a diagonal and open design that gives the impression of becoming larger and larger the further one goes in.” Indeed, this almost 14-metre offshore yacht combines the unique Frauscher design with the perfect living space. The 1414 Demon offers more room than any Frauscher yet. A well-designed lounge with a large bathing platform and a well-equipped bar in the outdoor area complement an interior with plenty of headroom, a large bath, a kitchen unit, a large corner seating area and sleeping space for up to four. The quality of the craftsmanship and the materials used reflect 90 years of boat building experience and top-quality yacht engineering. The jury argued as follows: “In the design of the Frauscher 1414 Demon, the lifestyle design idiom was applied in a masterly fashion to the theme of the yacht. The result is a successful combination of classic yacht elements, automotive design and high functionality with intelligent detail solutions and luxurious comfort, in which the clever space concept makes the cabin appear even larger than it is.” Michael Frauscher, the member of management who is responsible for Production & Development, personally accepted the award alongside KISKA owner and CEO Gerald Kiska at a festive award ceremony during the Ambiente trade fair 2018 in Frankfurt/Main. 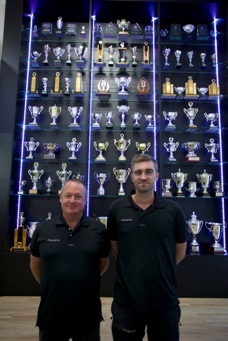 After its success in the Offshore Superboat Championships securing a 15th AUS1 championship title in 2017 Maritimo Racing is starting the New Year on a roll and is gearing up for the first round of the UIM XCAT World Championship in the UAE next month (March). Maritimo's Tom Barry-Cotter said the team’s race boat and workshop container are currently en route to the UAE and after spending the summer months testing and improving the boat he is confident it will be competitive. Maritimo Racing will compete in a newly refurbished 30ft Doug Wright design with two 400 ROS Mercury Racing outboards. Barry-Cotter said the boat had been completely re-rigged and repaired following its 200 kilometres per hour plus crash in 2016 and had been rebranded from Gold Coast Australia to Maritimo Racing. "We lengthened the boat to better handle the 400 ROS outboards and we have undertaken cockpit safety modifications with changes to the windscreen, seats and both upper and lower escape hatches," he said. Barry-Cotter said the XCAT series in 2018 involved races in the UAE, Europe and China and he was excited by the team's prospects. In 2017 Maritimo 12 crewed by Barry-Cotter and Steve Jellick proved to be a formidable combination in the Australian Offshore Superboat Championships and they enter 2018 as heavy favourites in a title defense. The forty feet Maritimo Catamaran has undergone an upgrade program amidst its off-season overhaul. Maritimo's second entry, Maritimo 11 crewed by father and son duo Ross and Andrew Willaton will compete in the new Maritimo R36 and will also present a strong challenge to the title defense. Barry -Cotter said the off-season had been spent testing and developing the new R36. The development of the R36 model will see it ultimately made available as a package for purchase, for anyone looking at getting involved in the sport. The first race in the Australian series will be held in Bowen in late April and the growing Super Cat Extreme Class will see the largest competitive fleet in many years, according to Barry-Cotter. "We are looking forward to both competitions and we believe we have positioned ourselves very well in terms of the boats we will be campaigning." Barry-Cotter said Maritimo was the only Australian luxury cruiser manufacturer that had its own race team and the experience and knowledge gained on the international race circuit was inbuilt into the company's range of production vessels. Captions: Tom Barry-Cotter and Ross Willaton hope to add to the Maritimo Racing's trophy cabinet again this year. The team in action in the Australian Championships last year. The Palumbo network continues its expansion policy with the aim of offering its customers the best and most complete service at competitive costs. With the opening of a new site in Constanta, Romania, on the shores of the Black Sea, we intend to optimize and increase specialized services for the offshore and engineering sectors. This is a new project that joins the existing shipbuilding network and is completed with the installation at the Tenerife shipyard of a floating dock suitable to deal with major jobs in the oil rig sector. International judging team, in support of the NMMA, voted the all new DC 365 to be the most Innovative product in the Center Console/ Walkaround Fishing Boats category during the 2018 Progressive Insurance Miami International Boat Show. “We are very proud of the engineering team we have assembled for Pursuit Boats and have refined a new product development process that accurately reflects market demands. We thank the NMMA and Boating Writers International for the venue to showcase our new DC 365,” Bruce Thompson, President, Pursuit Boats. Riviera is celebrating the success of the company's apprentice training program with the announcement of winners of the 2017 Apprentice of the Year Awards. Australia's world-class luxury motor yacht builder works with Queensland TAFE to train 74 apprentices including school-based, young and mature-aged apprentices. From this team, Riviera training manager Adam Houlahan and his staff utilised strict criteria to select four outstanding candidates as Apprentice of the Year for 2017, one in each training year. "We interview each apprentice's direct supervisor, seeking information about attitude, skills and their contribution to the team," said Adam. "We also check their work attendance record. "The candidates' involvement in our Propel program is also vital in judging. Propel is program of monthly sessions in which we teach life skills the apprentices would not learn in their day-to-day work. These include personality assessment, leadership, managing and communicating up the line as well as down. We also cover goal setting and how to handle their finances such as credit cards and opening bank accounts. "Our mission is to help build great people - taking them from skilled to excellent." Fourth-year marine craft construction apprentice Nathaniel D'Ambrosia said: "I have always loved boats and wanted to learn more about how they work." Nathaniel worked for a time on the development of the new Riviera 395 SUV and recently moved to work in motor yacht fitout. "This is the major part of a build when the deck, hardtop or flybridge and windscreen all come together - where the motor yacht is actually built," he said. Nathaniel has now completed his apprenticeship and is a qualified boat builder looking forward to expanding his career with Riviera. Third Year Electrical Apprentice Jack Gleadhill is excited that his course will result in a full electrician qualification. "We work on the entire wiring of the motor yachts," he said. "I am impressed that Riviera pays us while we study." Jayden Lee has completed his second year as an Engineering Apprentice and says he chose engineering because it exposes him to the full range of motor yachts and to the entire process of the build. "Our work begins from the time a hull comes from the mould through to sea trials," he said. Jayden particularly enjoys the Propel program. "Our leaders pass on so much of the knowledge they have gained over many years," he said. "We also learn how to best manage our skills." First Year Timber and Composites Machining Apprentice Joel Neucom loves the creativity in his work. "I love hands-on work and started at Riviera in cabinet-making," he said. "I now work in timber machining. We begin with rough-sawn timbers and create door jambs and many of the major joinery elements on board a Riviera. I particularly enjoy working on the finer details of a piece of joinery." Riviera Apprentice of the Year winners; Nathaniel 'DAmbrosio - 4th Year Marine Craft Construction, Jack Gleadhill - 3rd Year Electrical, Jayden Lee - 2nd Year Engineering, Joel Neucom - 1st Year Timber and Composites Machining. Australia's largest luxury motor yacht builder, Riviera, has moved to substantially enhance its presence in Japan with the appointment of a major leisure corporation, Unimat Precious, to represent the highly awarded Riviera and Belize marque. Unimat Precious is one of the largest marine businesses in Japan and uniquely placed to offer outstanding motor yacht owner care, owning eight marinas with more than 1,000 berths. Two of the marinas are in the Tokyo Bay region, the country's favourite boating destination. Riviera CEO Wes Moxey said the appointment of the respected marine industry professionals at Unimat Precious will be warmly welcomed by owners of luxury Riviera motor yachts throughout Japan. Mr Moxey says the appointment of Unimat Precious will provide additional support, assistance and social opportunities to the growing number of Riviera owners and to those aspiring to explore idyllic destinations throughout Japan. Sanlorenzo, the most iconic Italian shipyard, is the protagonist of the new “Stile a bordo” (“Style on Board”) book by Decio Giulio Riccardo Carugati and published by Mondadori Electa, which will has beenpresented yesterday at the Galleria Rizzoli bookstore in Milan. It is an elegant volume dedicated to the story of the excellence of Sanlorenzo and the innovative approach that, over the years, has enabled the company to expand its creative range, opening itself, as a pioneer in in this context, to different worlds that speak related languages such as art and design.It is a choice that has led Sanlorenzo to revolutionize the way of “living on board” without betraying its own style that has always distinguished itself through its timeless elegance and for its simplicity of form, the expression of a refined luxury which is never blatant, splendidly illustrated in this collection through the images of interior projects which are the fruit of the close collaboration with internationally renowned designer and architects and with the companies that represent the excellence in the field of international design. Thanks to the management of President Massimo Perotti and the role played by Sergio Buttiglieri, Style Director of the yacht division of the company, Sanlorenzo has in fact pursued new and unexpected paths: the desire to leave old practice behind has given life to collaborations with Dordoni Architetti, Antonio Citterio Patricia Viel and Piero Lissoni who have produced a total revolution of the aesthetic codes of nautical design through the adoption of a series of innovations and stylistic elements that have enabled them to bring the concept of “home living” on board. The role of design companies such as Boffi, Artemide, Paola Lenti, Ivano Redaelli, Edra, Minotti, Flexform, Penelope Oggi, Roda, and B&B Italia, which have studied ad hoc solutions for Sanlorenzo has been essential, adapting the technical characteristics, the materials and the construction solutions of their own products to marine needs. Not to be missed in this narrative is the reference by the author to the great masters of the world of design and art, whose works and icons, protagonists of the interior projects of Sanlorenzo yachts, have been carefully selected from the internal style center together with the ship owner, who is actively involved in every step of the design.The vocation for design in Sanlorenzo is accompanied by a great sensitivity to the world of art. As proved by the many initiatives organized in the last couple of years, such as the collaborations with Tornabuoni Arte on the occasions of Art Basel Miami 2016 and 57. Biennale D'Arte, and that with Triennale di Milano during FuoriSalone 2017.
launched during Tiara’s annual dealer conference and quickly garnered industry attention as the first Tiara featuring outboard power. The 38 LS is the modern reinterpretation of luxury sport yachting. The first in its series outfitted with dependable Yamaha outboard power, the style of the 38 LS is said to be athletic and performance minded while delivering a sense of luxury in her lines and layout. “We are absolutely thrilled with the innovation award and applaud our engineering and design team for delivering a product that exceeds market expectations. We thank the Boating Writers International judging team and the NMMA for providing a competitive venue to showcase a superior product,” Tom Slikkers, CEO S2 Yachts. The Viking 68 took the highest spot on the leader board at the recent Buccaneer Cup Sailfish Release Tournament. Challenging conditions with gusts blowing up to 30 knots didn't scare the crew fishing the 68 out of Palm Beach, Florida. Over back-to-back days the team released 25 sailfish to take home the title of Top Boat while Ryan Higgins claimed Top Captain. Steve Ehrbar was the 3rd Top Angler Overall and weighed a 55-pound wahoo for the Heaviest Meatfish. At Saturday's Awards Dinner, Viking President & CEO Pat Healey presented a check to The Billfish Foundation from the Recreational Fishing Alliance. The two organizations are working together to ensure the recreational fishing industry remains strong. Mdala, a Viking 62, clinched 1st Place at the Cheeca Lodge Presidential Sailfish Tournament in Islamorada, Florida. The Overall Champs took the lead with their 13th sailfish at the end of the final day. Captain John Hagen took the Outstanding Captain Award and Outstanding Mate Awards went to Codey Gunther, James Hagen and Alex Rifice. The rest of the crew included Steve and Eric Pfeifer, Cody Gunther and Tyler Valles. This was the 3rd and Final Leg in the prestigious Florida Keys Gold Cup Sailfish Championship. Mdala's win at the Cheeca Lodge cemented their 2nd Place Overall Finish in the series with 26 total releases. A Zeelander Australian owners was fortunate enough to experience close up action of “Team Vestas” which are currently ranked 3rd in the race. On first and second place are MAPFRE and China’s Dongfeng Race Team. On 4th place is the Dutch “team Brunel”. Vestas 11th Hour Racing is a Volvo Ocean 65 yacht named after it’s two main sponsors: a wind turbine manufacturer Vestas Wind Systems A/S and 11th Hour Racing, a program of The Schmidt Family Foundation. Did you know that these Volvo 65 yachts easily sail across the globe with an average speed of 24.8 knots and a maximum of 40 knots? The keel & bulb weighs as much as 3 rhinos! Hot on the heels of the 38 Open White Pearl, showcased by Mazu Yachts at Boot Dusseldorf in January, the Turkish boutique boat builder is delighted to announce a brand new model: the dynamic 52 Hard Top. The 52 Hard Top is built of carbon composite in a lightweight sandwich construction for rigidity and strength. Following very much in the vein of its Open models in terms of styling and performance, the extra length overall offers more interior volume and deck space, plus the addition of an open-sided, carbon composite hardtop for protection from the summer sun. In short, it continues the handcrafted, luxury yacht feel of the Mazu range with enhanced on-board comfort for extended overnight cruising. In fact, the hull is just 15 centimeters higher than the 38 Open, but the interior layout provides for two guest cabins with separate bathroom facilities and a spacious dinette/lounge area. This is in addition to the large fore-deck, protected cockpit, and open aft deck and swim platform. Powered by twin Volvo 600hp engines with IPS pod propulsion, the Mazu 52 Hard Top will have a top speed of around 37 knots and a cruising speed of 32 knots. The first 52 Hard Top, already in build for a client at the Mazu shipyard in Istanbul, will be launched at the end of May before undergoing extensive sea trials. The new model will then make its international debut at the Cannes Yachting Festival in September 2018. With the new Sundancer 320 Sea Ray shatters all assumptions, re-imagining the balance of indoor and outdoor space with a sport cruiser that is as versatile as it is elegant, and a new mix of center console exterior amenities and cabin interior comfort. Indeed the Sea Ray 320 Sundancer features a full length crowd-pleasing main deck cockpit, and a remarkably comfortable sleeping four cabin. The exterior impresses for its bow lounge area sure to be the one of the most popular zones on-board. Launched in the fall of 2017 the Sea Ray 320 Sundancer features interesting design and comfort choices, and for the ever popular outboard lovers it is also available in that format from beginning of 2018. Contest Yachts from the Netherlands presents its new World wide web virtual showroom. Founded in 1959 by Ed Conijn, the Dutch builder launches its first model in the same year launching the 25 sailing cruiser designed by Gerard Luyten of which three hundred plus units are sold. The company continue to expand over the years and decades, building always larger and more luxurious sailing cruisers and yachts which today go up to the 85CS flagship. In 2003 Ed Conijn passes over the helm to son Arjen. Arjen Conijn will continue to expand Contest yachts in size, and in 2011 the Dutch builder enters the motor yacht market with the 52MC. The 52MC first launched in the Fastlane, is later on expanded in the Flybridge, Open Sport, Classic, and T-Top versions. Contest new website takes you around with the following buttons; Contest Range, Contest World, Contest Group, Contest Media, and Contact. Contast is also on social media with bottom of the link buttons taking you to its Facebook, Linkedin, Twitter, and Youtube pages. Returning back in full production in 2017 with the presentation and launching of the new S450 model, Italian Cayman yachts continues to present new updates concerning its future showing this project for an important new F920 flaghsip. The F920 is currently under construction in Italy and is a design to Italian designer Ferragni who previously had work experiences with Baia, Italian Yachts, and also the Capelli small boat and rib range. The Cayman F920 will compete in the competitive raised pilot house 27 to 28 meter segment, tough at this stage it is not understood if it will feature the desired owners stateroom on the forward part of the main deck. Numarine, the European high performance motor yacht shipyard headquartered in Istanbul, Turkey offering a range of yachts from 62 to 105 feet, is delighted to announce that the very first hull of the 26 XP Explorer Series has been launched. The yacht’s premiere is planned for the Turkish Eurasia Boat Show held in the second part of February 2018 in Tuzla near Istanbul. This compact 26-meter expedition vessel was sold in May 2016 to a returning customer from Turkey. This the fourth Numarine for this loyal client, before which he owned the 78 Flybdige yachts. Numarine’s long-term collaborator Can Yalman designed the 26 XP’s exterior and interior. Naval architecture is by Umberto Tagliavini. She is very modern, even futuristic, due to angular windows and a vertical bow, and carries the DNA of a larger model, the 32XP, the first of which was launched last summer. Designed to offer the same capabilities of her longer sisters, the 26 XP’s smaller draft allows her to berth in shallower harbors. 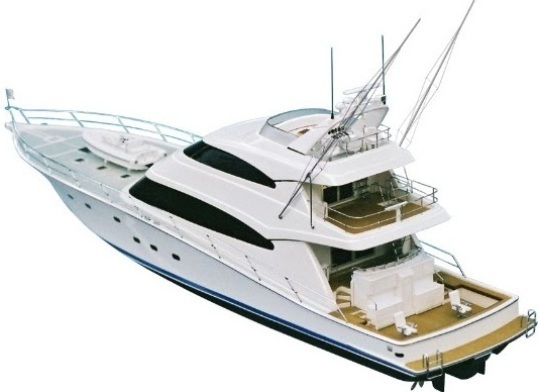 The yacht has well proven and efficient hull, specially designed for ocean cruising. The first 26 XP unit was built in the very efficient, semi-displacement version. The superyacht will achieve a maximum speed of 22 knots, with a cruising speed of 18 knots. Her sophisticated interior is spacious and refined. 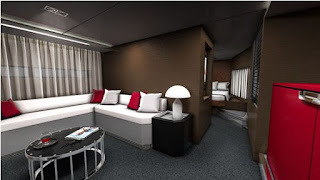 There are four large guest cabins below decks, including the master suite amidships and two VIP cabins. Social areas are vast, with an extensive main saloon, beach platform and a special flybridge with its own lounge, dining table and even storage space for a 5-meter tender. To ensure the maximum level of comfort on board the 26 XP, Numarine took great care in eliminating or reducing all sources of noise and vibration. The onboard systems that resolve these issues are from the shipyard’s longstanding partner Silent Line, noise and vibration experts for luxury yachts, commercial vessels, and industrial and architectural projects. The 26 XP is also unique due to her flexible design concept. While the first unit was built with the semi-displacement option, there is also the possibility to choose the displacement version: here, the yacht’s maximum speed is 11.5 knots, with a cruising speed of 9 knots and greater fuel autonomy, up to 3500 nm at 8 knots. The 26 XP is looking a success for Numarine with four units sold, three of which will be of the displacement long range version. Fairly soon after the introduction of the new Executive 1500 Mk.II and 1850, Dutch builder Van Den Hoven started seeing demand from the market to fill the gap between the two new models. This was how the new Executive 1700 Mk.II project, currently under construction in Waspik started to take shape. The new 1700 Executive Mk.II design follows the modern and international design language established by the 1850 and 1500 Mk.II, but with its own clear identity. Examples include a redesign of the side windows and a fresh take on the hull. New design methods have also made it possible to combine higher speeds with a lower fuel consumption. As Van den Hoven interiors are well-known for their intelligent layout and spaciousness, with a great deal of attention to this aspect for on board comfort. The galley, wheelhouse, lounge and dining space flow naturally into each other, adding to both the cosines and convenience. For instance, guests can enjoy a drink on the aft deck, the modern galley invites top-notch cooking, and there is plenty of space around the helm for people to gather and socialize. The standard version of the Van Den Hoven 1700 Executive Mk.II is equipped with twin Volvo 225hp diesel engines with line shaft propulsion. Atlantis up until some time ago a separate brand of the Azimut Benetti Group enters its third phase of design with this new 51, World presented along the 55 Flybridge during the 2018 Dusseldorf boat show. In this new Atlantis 51 designers Neo Design integrate looks more inline with Azimut yachts, see bow design with similar grill to the S series. The Atlantis 51 presents itself as a traditional Mediterranean sport yacht with a spacious open hard top covered main deck, and an interior with a traditional three cabin layout; forward owners stateroom, two guest cabins at midships, and saloon and galley in between the cabins. In short the Azimut Atlantis 51 is very much similar to the 50 model its replaces with important design elements which take her to the next design phase and a renewed propulsion system now with Volvo IPS pod drives. 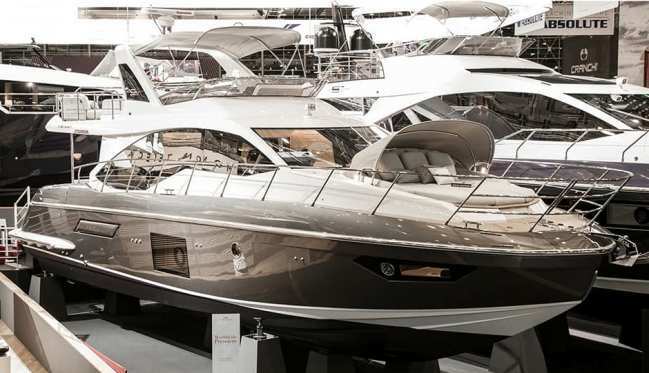 This made in order to make the Azimut Atlantis 51 compete with the like of Fairline 48 Targa Open, new Princess V50, and Sunseeker 50 San Remo. With the increase of super yachts sizes the tender boat market has received a boost in recent years, not only expanding the offer but also becoming bigger. To be exact today the word tender means not only a support vessel for a bigger boat, but some of these tenders especially those going over the ten meter size also tend to be of service to seaside residencies and used purely for day boat duties. Tornado who founded in 1968 is celebrating fifty years in business present the project for the 38 T-Tender, based on the platform of its most successful model to date the long produced 38. Designed by architect Gianluca Caputi, a famous from Rome naval architect who I remind was responsible for the third generation Italcraft which span from the end nineties up till the first decade of the second millennium, the Tornado 38 T-Tender features a complete revised design which concentrated on the main deck extending cockpit size by over two meter. Thanks to this the main deck of the 48 T-Tender is not only larger to the standard 38 model, but will features a more spacious L-shaped dinette and a second looking backward L-shaped lounge. The trade off for this is a smaller interior which now features a V-shaped forward sofa which converts to a second berth, and separate medium sized shower head. The Tornado 38 T-Tender will be powered by twin Volvo 300hp with stern drive propulsion which give a max speed of 37 knots. With the launch of the 50 Gran Turismo Sportfly Beneteeau completes the circle of its sport cruiser range which now is all redesigned to the lines of Italian from Venice designers Nuvolari and Lenard. The new Beneteau 50 Gran Turismo Sportfly is a border model just going over the fifteen meter size to be considered a yacht, and adding a sport flybridge on the standard Gran Turismo 50 hard top. Access to the flybridge is from the stair case ladder to starboard. The flybridge offers a layout with C-shaped dinette and forward passenger settee to port side, and helm station to starboard. For the remaining the Beneteau 50 Sportfly is identical to the standard Gran Turismo with the choice for three or two cabins, and a spacious L-shaped galley located on the lower deck. The Beneteau 50 Gran Turismo Sportfly is powered by twin Volvo 435hp engines with IPS pod propulsion. 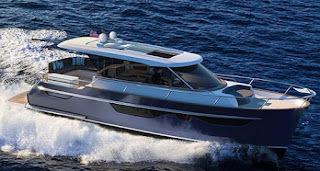 Uniesse continues in its pursuit in exciting its fans and boaters alike with an endless list of new projects coming out from the technical office of the Italian build American owned name. The Uniesse 125 Tri Deck is the latest to come from the drawing board what is a flagship largest project to date. As the model name says the 125 is a triple deck super yacht and will also feature a semi wide body design for the main deck, this portion usually reserved to a spacious owners stateroom. The second deck which also accommodates the pilothouse will feature a Portuguese style forward balcony. 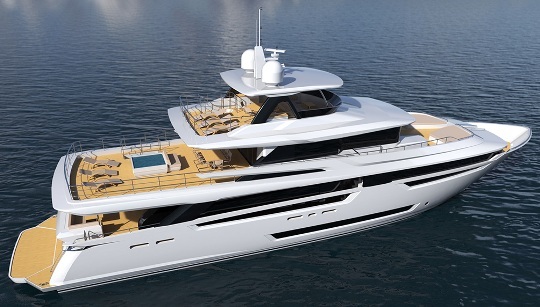 It will be interesting to see if Uniesse will produce this project or any other of the three projects above the 24 meter size it presented in recent years, with its largest ever build still being the 75 HT model it launched in the end of 2007. With a private ceremony, CRN launched M/Y Laton a 50 meters inspired by the historic Superconero line of the Sixties. Superconero 50 meters marks the success of a new collaboration between CRN’s Engineering and Interiors and Design departments with the Zuccon studio of Rome. The result is a displacement yacht in steel and aluminium with a classic style and refined details, each chosen individually by its Owner. The balance between the interior volumes and the desire to make the vessel as lean as possible have led to the creation of a yacht with sleek lines and a slender bow. With its 50m length, and five wide decks, the new CRN Superconero is characterized by the large interior spaces and extensive windows that offer the owner and his guests constant contact with the sea. The design solutions implemented by CRN make it possible to fully experience the navigation experience, thanks to the balcony used for cruising and the terrace overlooking the sea, the area is open and enjoyable when the yacht is moored. The garage is floodable, allowing the tender to enter the water without using a davit, and transforming a purely technical environment into an open-air living area perfectly integrated into the beach club. CRN 50m Superconero will be presented as a world premiere at the end of September 2018 during the Monaco Yacht Show. Designed by Evan Marshall, the US designer and his team took the extensive knowledge of Ocean Alexander and masterfully revolutionized its legacy introducing the 90 Revolution Enclosed, a super yacht unlike anything the Taiwan builder has build to date. The Ocean Alexander 90 Revolution Enclosed not only offers new design elements, but also enters in the the competitive semi wide body 27-28 meter category offering a forward main deck owners stateroom, and three or four guest cabins below deck. The Ocean Alexander 90 Revolution Enclosed is to be powered by twin MTU 1600hp engines, and is to be launched in second half of 2018. A 90 Revolution Open, with the fly helm deck offering a open style hard top is also available. Horizon has launched the new V68, which surprises for its large yacht features ingeniously fitted within a manageable owner/operator framework. 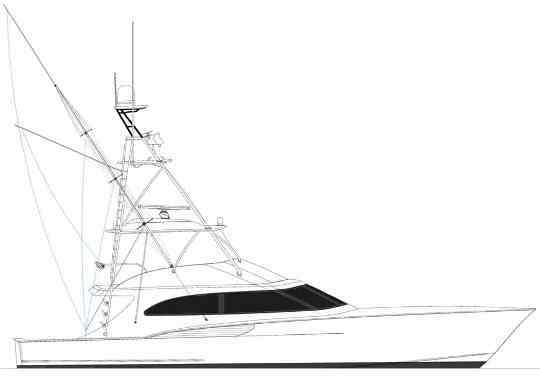 Named in project stages as V67, the V68 was created in collaboration with world-renowned designer Jonathan Quinn Barnett and has been planned throughout with spacious accommodations, wide side decks, and a voluminous interior based on six meter wide beam that takes advantage of large windows in the main deck and cabins. The Horizon V68 offers a flexible three or four stateroom layout, with optional crew quarters aft, as well as various configurations for all three decks including open and enclosed bridge. The V68’s plumb bow design, a striking feature from Stimson Yachts hull design allows for a longer waterline and reduces drag at lower, displacement speeds; the larger hull beam also makes for greater stability when it counts most, at slow speeds. Ideal for first or second-time buyers, families and owner/operators, the Horizon V68 provides the qualities of a superyacht with a safety, solid architecture, and customization all in under 21 meter size. The Horizon V68 is powered by twin Cats 1136hp engines. It was a big showdown for what is considered the largest on land and all inside boat show on the planet. Dusseldorf always delivers but for 2018 it had an extra gear with all the main European players not only attending but coming to the show with an important display. For nine days in the last week of January 2018 the North Central German city connected to the North Sea by the Rhine river was the super market of yachting. There was a lot of important players who made the 2018 Dusseldorf a special one. Azimut used the show to unveil two novelties, Ferretti Group made a big statement taking along some of its most important recent new models and presenting projects and plans for the future, and Princess who has been a big supporter of the show in recent years continued where it left. Obviously such attention to Dusseldorf comes as proof of a healthy Yachting sector and a believe that the European and the Global economy is on the upswing. More so it shows a believe in the German economy, which has always had an important role in the European economy.